MECHANIC: RESURRECTION is one of the most utterly unnecessary and baffling sequels that I’ve ever laid eyes on. It's so D.O.A. and on pure autopilot that you have to wonder if actual human beings were anywhere to be found behind the scenes during its production. 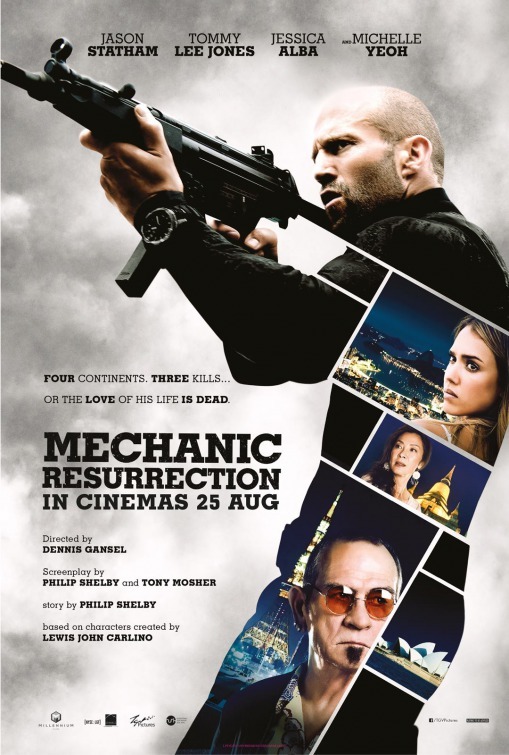 What makes the film all the more “unnecessary” and “baffling” is that the previous entry – 2011’s THE MECHANIC, a decent, but forgettable Simon West directed remake of a classic Charles Bronson flick – received such a timid critical and audience reception that one has to question whether any filmgoer was actually clamoring for the continuation of this series. Considering that the initial installment made just a paltry $60 million worldwide on a budget of $40 million is equally head-scratching. What studio thought there was a loyal fan base for this series? I need to relay something right from the get-go here: I’m a fan of Jason Statham. Actually, you could even aptly label me as a Jason Statham apologist. I'm one of the few critics that gave positive reviews to his three TRANSPORTER films (the Statham-less TRANSPORTER REFUELED…that doesn’t…really count) and thought that his two CRANK films were unmitigated hoots. I’ve always appreciated the steely eyed and stone cold actor for bringing a stoic deadpan demeanor to this films while more than selling them as works of pure bare knuckled and teeth clenched kick assery. Yet, even the staunch defender on Statham in me is beginning to see a damning trend in his film and role choices: he’s becoming more of a one-note brand and less of an appealing and charismatic actor. There’s no doubt that he brings his characteristic and sizeable brawn to the table in MECHANIC: RESURRECTION, but there’s absolutely no joy to be had in his performance. He simply seems to be lazily and unenthusiastically going through the motions. The film has a mindlessly conceived plot that’s the stuff of low rent button mashing video games. Statham reprises his role as Arthur Bishop, whom we learned in the first MECHANIC film is a lethally cunning assassin for hire that is able to methodically make any kill look like an accident. He has retired from that lucrative, but ultimately dangerous gig and has gone into hiding with a new identity in Rio di Janeiro (the only time the film achieves some semblance of fetching aesthetic beauty is with its sumptuous establishing shots of its foreign locales). When a new contract offer comes his way and his true identity is revealed (which ends in predictable, yet nonsensical violence), Bishop flees to Thailand and reconnects with his old friend Mae (Michelle Yeoh, an icon of action cinema that’s given absolutely nothing of substance to do here). She takes him in with open arms, but Bishop still seems to be looking over both of his shoulders. Trouble – wouldn’t ya know it! – finds Bishop in the form of pretty aid worker that – I kid you not – works with Cambodian orphans. Gina (Jessica Alba) appears to be the chronic victim of domestic abuse, seeing as she’s riddled with bruises and cuts. Bishop begrudgingly decides to help her out, but in defending her from her hot tempered boyfriend he inadvertently kills him and then learns that a larger plot is at play being perpetrated by the man that originally wanted to hire him earlier, Caine (Sam Hazeldine, in one of the most vanilla plain and bland action film villain roles of recent memory). Of course, since Bishop too was an orphan, he grows intimate with Gina (convenient writing alert!) and just as they two of them become closer she is kidnapped by Caine’s goons, after which time he demands that Bishop embark on three high value assassinations for him in order to free the love of his life. Okay, I never once believed that Bishop and Gina loved each other, or hell…even cared for one another. Alba and Statham have absolutely zero chemistry on screen together, which makes the overall plot involving Bishop partaking in the assassinations to free her dramatically inert. I never once believed that Gina was a Cambodian orphan care worker. I never once believed that Bishop would fall for her as quickly and swiftly as he did. I never once believed that he would risk life and limb to take on Caine’s mission to save a woman that, when all is said and done, he barely knows. I just never once believed anything that transpired in this film. It never felt authentic in the slightest. It’s also patently offensive that the screenwriters here use real third world social strife as a simplistic plot device to propel the film forward to the next sadistically violent action set piece. One has to question Alba’s (a very established Hollywood actress) willingness to appear here, especially considering her recent less than flattering comments regarding her past film roles. Gina is such a regressively denoted character here, one that occupies this film’s archaic demands to have a cheap damsel in distress. Alba looks good in a bikini, though, so there’s that. But is Gina even a remotely intriguing personality here? Nope. I guess all we are really left with is the would-be enthralling action and spectacle in MECHANIC: RESURRECTION, but the film even insipidly fails in that respect as well. Not only is this film’s action mournfully high on shaky cam gimmicks and headache inducing editorial overkill (making – sigh – overall geography and clarity during these sequences eye straining to the max), but there are also a handful of individual moments that inspire incredulous laughter more than theater seat grabbing excitement. Take, for instance, an unintentionally campy sequence that has Bishop breaking out of a heavily guarded ocean based prison (don’t ask) by utilizing some heavily lathered on and smuggled in shark repellent cream. There’s also an equally ludicrous moment when he uses one of Caine’s henchman as a human shield while detonating one of his grenades, which kills all enemies in front of the body, but leaves Bishop perplexingly scratch free (he also seems to have a pistol during this same sequence that opportunely never runs out of ammo for what seems like an eternity). MECHANIC: RESURRECTION has one potentially nifty scene involving Bishop scaling a high rise to kill a target that’s swimming in his pool that hangs over the building’s rooftop. The sequence has instances of ingenuity, but is ultimately betrayed by some truly horrendous green screen work in some shots. To add ultimate insult to injury, the great Tommy Lee Jones (yes…that one) shows up in what amounts to a five-plus minute paycheck grabbing cameo as an arms dealer that also happens to be one of Bishop’s targets (Jones does bring some rascally charm here in a completely throwaway part that – combined with his appearance in the awful CRIMINAL from earlier this year – makes one doubt his agent’s keen knack for helping his client pick juicy and substantial roles). Jones’ pathetic underutilization here was the final nail in this film’s coffin. MECHANIC: RESURRECTION is aggressively idiotic in its intelligence insulting scripting and beyond obvious attempts to turn this “franchise” (ultra sarcastic usage of quotation marks intended) into a lame James Bond clone (even the music cues here try to capture the famous chords of the 007 theme throughout). I was bored stiff with this film at the fifteen minute mark. Something unfathomable triggered the creation of MECHANIC: RESURRECTION (I counted eight executive producers here), and as for how money was secured to fund this sequel that (I'm wagering) 99 per cent of the paying filmgoing public didn’t want? A documentary about that process would have been inordinately more entertaining than sitting through this endurance test of a wasteful film.